A high-risk pregnancy simply garners more medical attention than a normal pregnancy. So every dad (or soon to be dad) whose wife is placed on hospital bed rest is accustomed to the plethora of nurses, janitors, and doctors constantly checking on your loved one. With all of the daily interactions, your caretakers are bound to make minor mistakes. If you are able to find the humor in your hospital stay, you may bring a little joy to your crisis. We were only a few days into our two – month stay on the third floor, high risk unit at an incredible hospital in Tampa and Heather was in the middle of a pedicure from Grammy when the door opened once again. However, these two bodies at our door were actually decked out in hazmat suits. This full body protective gear is normally seen only in movies about nuclear bombs and Ebola Virus news reports from Africa. To our dismay, the two proceeded to enter our room. 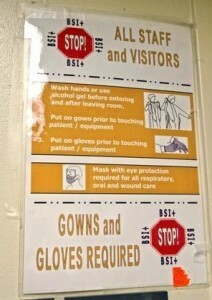 Fortunately, we heard the voice of our favorite nurse behind one of these alien suits. She proceeded to tell us that my wife tested positive for MERSA, which is a nasty staph infection that runs rampant in hospitals. Questions popped into my head such as: How much worse can this possibly get? Is my unborn baby okay since my wife’s water broke and is susceptible to infections? And why is God punishing us? The good news is that our MERSA scare turned out to be short-lived as there was a mix up of lab results. The bad news is that one of my hallway coffee pot neighbors was about to experience the bad MERSA news. We quickly learned that every day and night is a true roller coaster. A curve ball was thrown our way seemingly every week. When my wife reached 28 weeks pregnant (one month into our stay) we had a code pink alert. 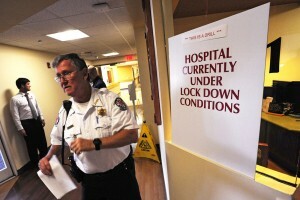 The exercise is planned by the hospital security team to test crisis preparedness. Often nurses and staff are not told about the upcoming drill. So nurses sprint down hallways, entries and exits are in lock down mode, and a massive security presence rattles nearly every patient in the hospital. In this case, somebody acted as an abductor of a baby who tried to escape outside of the hospital with a baby mannequin. The staff and security caught the“abductor” and everything was back to normal in no time. More questions popped up such as: Why does this whole experience keep getting stranger and stranger? Can we just have a couple of days of peace and quiet? After that first code-pink, we actually looked forward to them as it shook up the day. Unfortunately, the oddball events don’t end when your preemie has left the hospital. Our daughter came down with the swine flu not long after our son left the NICU and. Even though we had adapted to the curveballs in the hospital, we still couldn’t help but ask ourselves questions such as “Again?” and “Seriously?” Simply accepting not only the day- to -day stress but also the strange events that accompany a high risk pregnancy is the best antidote to the anxiety ridden experience. As they say, sometimes time heals what reason cannot.